If you’re anything like me, you’ve got to that time of the year where you’re fed up with the everyday grind. You deserve a break. A week off the endless demands perhaps. If another person asked me what pay grade Steven was employed at in 2009 I was going to scream. I’m just so over it, you probably are too. This time I had no energy to arrive on holiday and make a load of decisions, I wanted to chill. Don’t get me wrong, I love landing in a city with no sure-fire plans and working it out as I go. The excitement of where to go, what to wear and who to flirt with is still very much real. However, right now, I am totally exhausted. We are understaffed at the office and I find myself doing at least 2 people’s jobs every day. I just need a holiday sometimes where I can relax, recharge and even check a bag filled with nice outfits I can enjoy having the time to style. 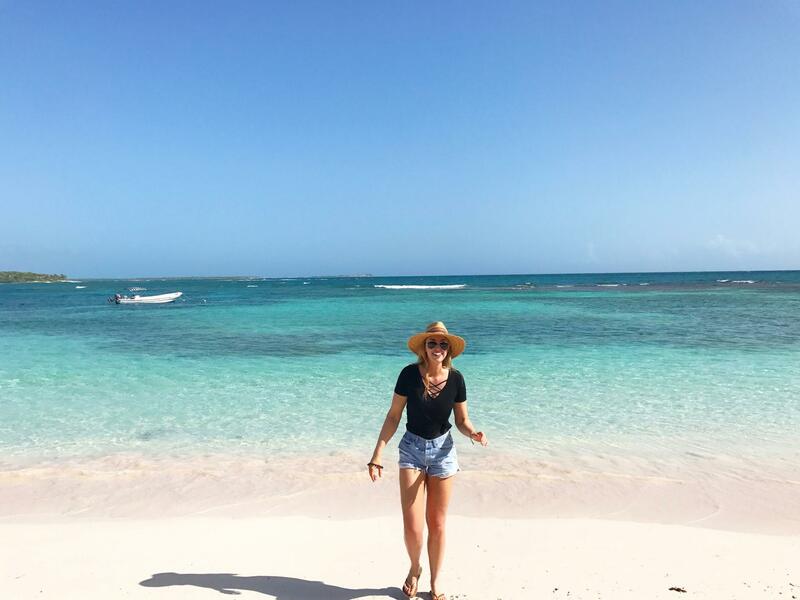 I travelled to Antigua for a 7-night break and stayed in two different resorts to get a feel for the different options available. The one I am writing about today is called Pineapple Beach Club . 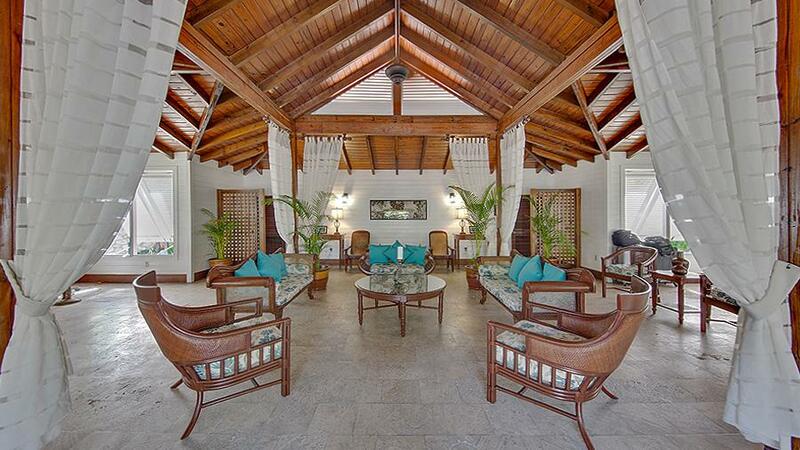 The hotel is part of the Elite Island Resorts group of hotels with stunning places to stay all over the Caribbean. 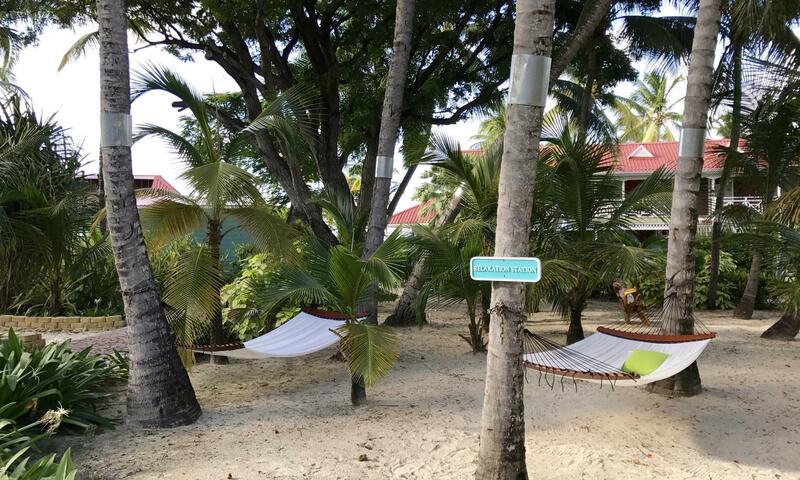 Pineapple Beach Club is a 4* all-inclusive resort but frankly, I fail to comprehend why it isn’t a 5*? Unless Ryan Reynolds was personally pouring you a drink in a speedo I am not sure how they could top what they already have going on! Surely Most Resorts Are the Same? So many resorts try to be accommodating and offer up a plethora of options as soon as you arrive, from what you are given to drink on arrival to dining reservations. I always just want to tell them to leave me alone! I’m exhausted, I’ve had a long flight, I feel like I can’t even decide which sunglasses to wear! Picking which night to dine in the Italian after 8hrs in economy is likely to just about finish me off. And that is why girls, Pineapple Beach Club is one of the greatest places you will ever travel to. They know you’ve got a busy life; maybe your kids have driven you insane and you couldn’t wait to have a break, or your boss is a demon worse than the one in Devil Wears Prada. They know your ex is someone you need to be on a different continent from and that you need to be given enough rum to forget existed. They got you babe. 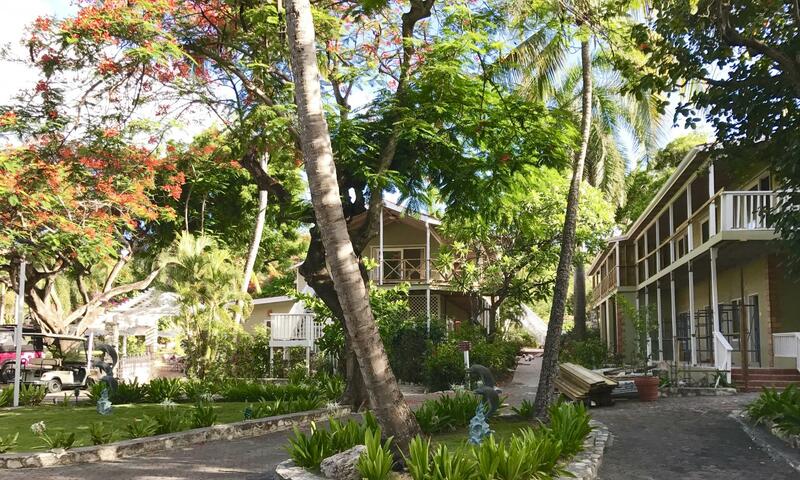 This is the most laid back all-inclusive resort in Antigua. Everything is done for you and designed for you to have the nicest, most stress-free time possible. Even more importantly, the bay the hotel is situated in is breath-taking. 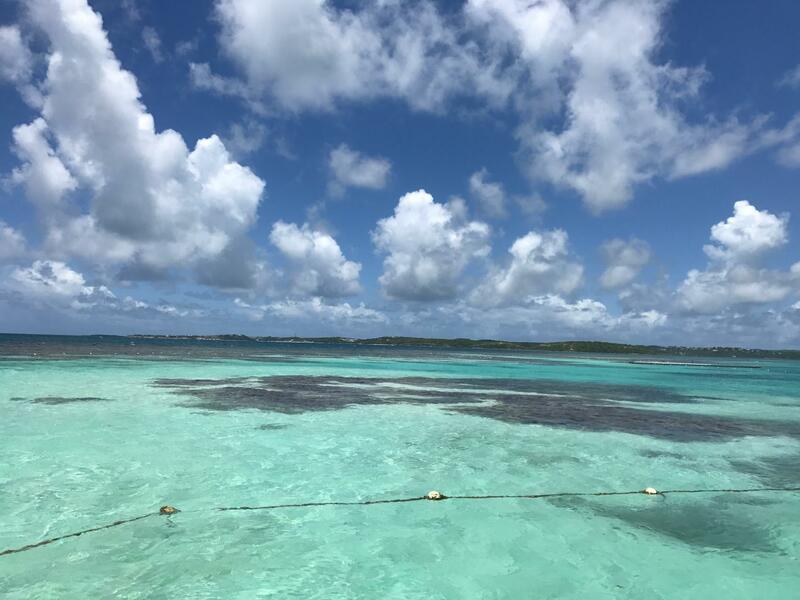 The sea is a bright, iridescent blue green, the stuff of TV commercials, and the quarter mile of beach has the most beautiful fine white sand. Everywhere you go and everywhere you look is absolute paradise. 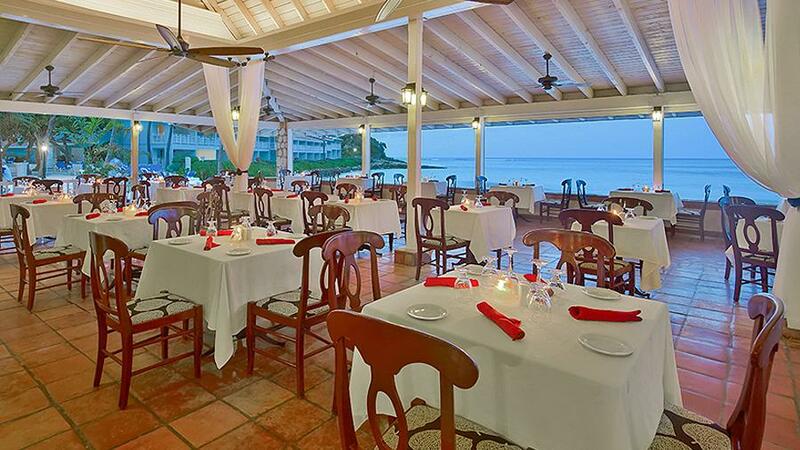 Check-in involves sitting on one of the chairs pictured below, sipping on a rum punch that arrives unprompted on a tray alongside a cold towel you can dab at your (likely sweaty) self and feel like a celeb. 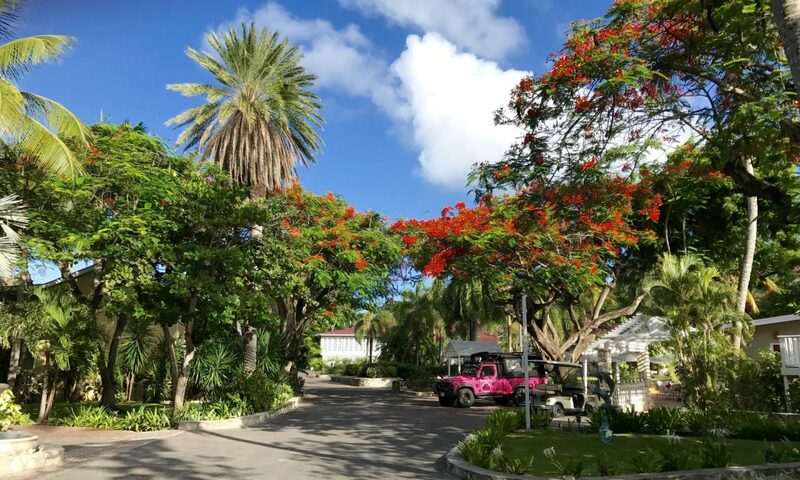 They take a quick look at your passport and job done, you’re whisked off by another lovely staff member, on a golf cart, natch, to your gorgeous room. No drama, no fuss. Why is my whole life not like this? Also, can I please move in to reception? It’s more aesthetic than my entire apartment. Our Waterfront Room layout was amazing for two friends sharing together. There is a sizeable room with a big balcony that overlooks the sea. Inside the room is a huge wardrobe with plenty of space for both sets of clothes. These rooms are in a newly refurbished two-story building, pictured below, furnished with 2 double beds or 1 king bed complete with rattan furnishings and a 32-inch TV. 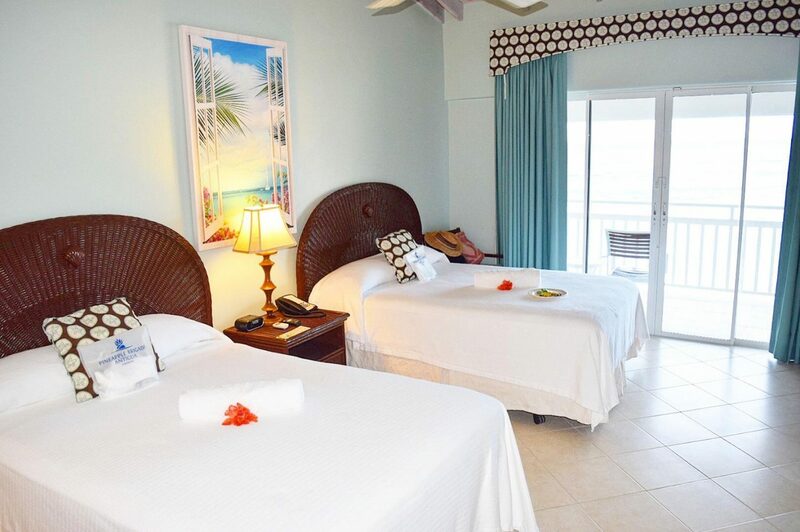 Aside from our beautiful Waterfront Room, other guest accommodations are also available in one, two and three story buildings, each reflecting the easy-going and colourful Caribbean architecture and lifestyle. 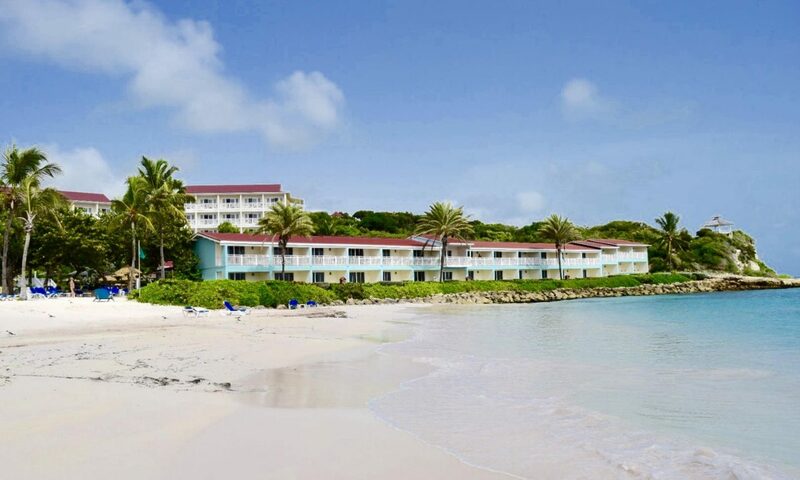 Some overlook the resort, some the gardens and some the beach. Unless you specifically love a sea view I really think all the room views are equally lovely and you can’t go wrong with any of them. There’s every amenity you could want in your room from proper coffee makers and filters to an ironing board and iron, hairdryer and plenty of toiletries should you decide (unlike us) not to take your entire bathroom with you. You see? 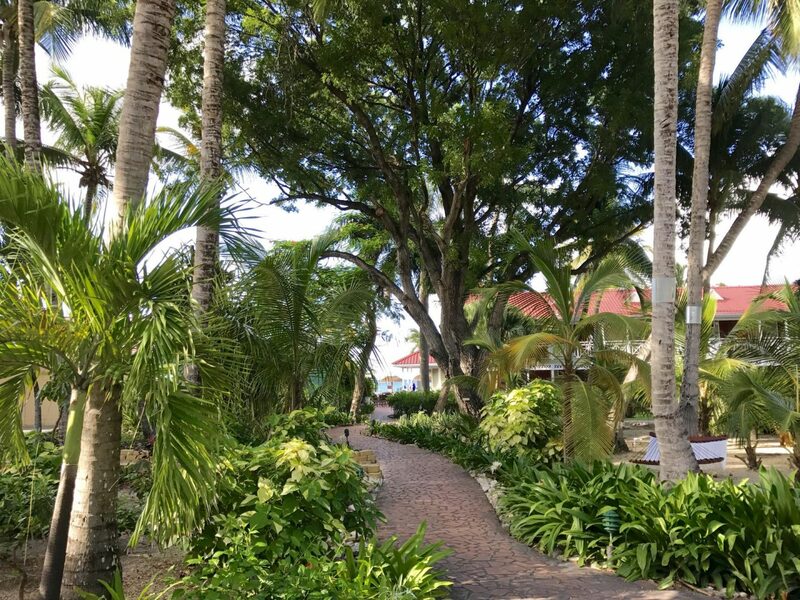 You and your partner (in crime or otherwise) can inhabit this space easily without feeling cramped and just wander about happily with what I like to call my ‘Antigua smile’ plastered on your face. Obviously other rooms around the resort are styled similarly but have different beds or more rooms which are available to accommodate families or couples. 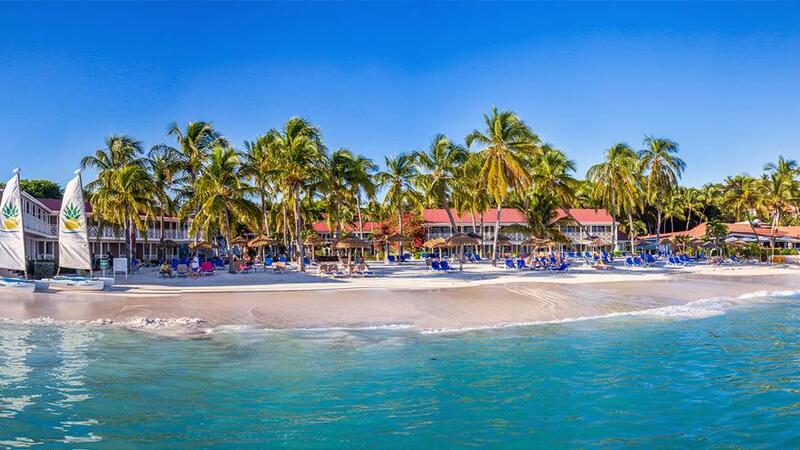 Pineapple Beach Club is situated in the beautiful Long Bay, with amazing ocean views, 30 acres of gardens and palm trees and an authentic Caribbean vibe. The colourful buildings are spacious and breezy; all the furniture is so comfy. There’s even a chill out area near the bar you can lounge in during the day if you’re feeling like being out of the sun and just want to chat or read. 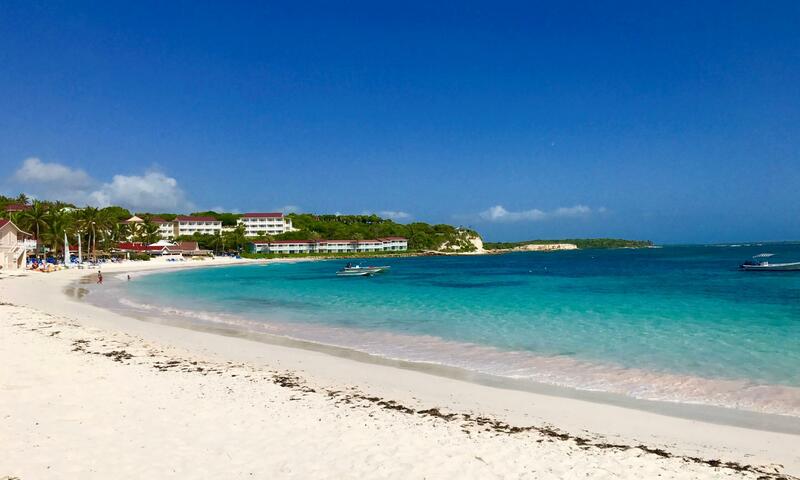 Another bonus for those without children or perhaps on a holiday away from their own children for a break is that the resort caters to only adults 16 years and older including singles, couples, families and groups. I did personally enjoy this, not because I dislike children, but let’s be honest children can be very loud! This resort is all about relaxing and having a break so I think it’s great that it’s adults only. Now – we can go no further without a little chat about the food. I love my food but Sophia, bestie and camera woman extraordinaire, that tiny girl can EAT! What that means is I always listen to her food reviews, and she was living for that French toast and maple syrup. 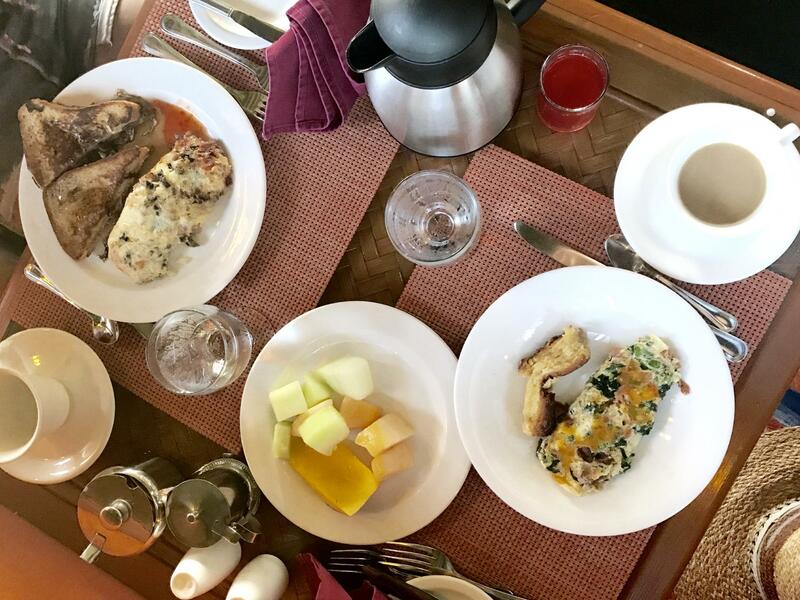 Even without the pool, the spa and the sea view, we would quite frankly get on a plane for eight hours just for the amazing breakfast. The breakfast is laid out in the Topaz restaurant’s central section and is absolutely massive. I’ve never seen anything like it and I’ve been to a lot of places. An amazing breakfast buffet is the difference between a great holiday and a hideous one in my opinion, and we gave this one 483 out of ten. Let me describe: there are mountains of fresh fruits (mango from Antigua is some of the best in the world). And then in carb central there are the miniature pastries, croissants, all sorts of breads and bagels to toast yourself, pancakes, waffles, French toast with cinnamon and syrup which might make your eyes roll back in happiness. You will WANT to put on 10kg’s. The piece de resistance is the omelette station where they make you fresh omelettes while you wait. In some sort of extreme omelette’ing fashion they manage to make 4 at once! Pick all your toppings and make the difficult decision of cheese or no cheese and then you’re set for a mouth-watering meal. Top it with a little Susie’s Hot Sauce if you’re feeling spicy. If by any sad chance of fate, you are on an enforced holiday diet, then do not worry, there are heaps of healthy options from smoothies and yoghurts to poached eggs and granola. Breakfast, lunch and dinners are all served in the main Topaz restaurant so I should describe the dining room: high ceilings, whitewashed wood, tiled floor and ceiling fans are a great start. But then you realise it’s totally open to the elements on one side and you’re sitting bang on the beach. You can see from the picture above I pinched from the website as I didn’t want to start taking photos of other diners so they didn’t hate us! They do have sun shades for breakfast so you can see what you’re eating but in the evening the shades are open and you can listen to the waves lap against the shore as you eat, so relaxing. Chef Pietro’s serves á la carte Italian specialties. Our favourites were the calamari, mozzarella balls and seafood pasta. This is a lovely little restaurant just off the main one, again quite open so you get that lovely Antiguan breeze and right near the beach. The food and the servers here were so lovely and we left with a very full tummy! Pineapple Grill serves á la carte grill options. This was my favourite of their restaurants and I had the steak and mashed potatoes and Sophia had lobster thermidor. We basically stuffed our faces and enjoyed every minute. The food is better than I have had in many London restaurants and frankly, I was shocked there was this level in an all-inclusive resort, and Lobster too! We love a bit of lobster. All of these restaurants are available to book with no extra charge. The only thing I would mention about the resort that is something to think about pre-packing is they have a dress code for the evening, in that you can’t wear flip flops. So, remember to take some comfy flat mules and you’ll be fine (luckily I took glitzy flippy floppies that didn’t get me kicked out)! Pelican Snack Grill offers light snacks by the pool throughout the day such as burgers and fries. You don’t need to book this one and the chips are just what you need after a few too many cocktails the night before! The Outhouse offers BBQ ribs, yummy jerk chicken and rice with awesome views out to the beautiful glittering sea. If you want to, they are happy to book you in with 24 hrs notice, or you can just say ‘hey go wild’ before you get there, email guest services and they will book you in on random days of the holiday and you’ll get a note when you get there about when it is. This is what they did for us and it was so nice not to have to bother doing it ourselves and was like every day had a jazzy surprise! Very quickly you get into the amazing pattern of omelette excitement, sunbathing, beach lolling, rum punching, chatting to other people (as everyone is SO friendly), supper and then you just repeat, adding in a few activities, some of the free water sports and then hanging at the bar in the evening or going on a night out to the local bar Roadhouse. I was impressed they have a decent gym which I went to a couple of times. There are cardio machines, spinning bikes and a weights room with plenty of machines, a cable machine, dumbbells, benches and a few barbells with fixed weight so if you want to work off your mountain of waffles and get a pump on before pics to show off your abs you can easily do that or if you prefer organised workouts there’s always aqua aerobics! I enjoyed the gym being so empty and not having to fight anyone to get on a machine like at my regular gym. Working out is so relaxing when there’s not pumping techno or people using ‘your’ machine. There’s also a beautiful spa so if you’ve not had time to have any pre-holiday treatments or you just fancy a massage to get rid of that flight-bloat that really just drives everyone nuts, you can do so in style. There’s a tennis court with a pro available for lessons, touch rugby, football, beach volleyball or if you go to the water sports desk near the colourful beach huts you can go snorkelling, windsurfing, kayaking or sailing, again all for free. You get so many free options at this resort. 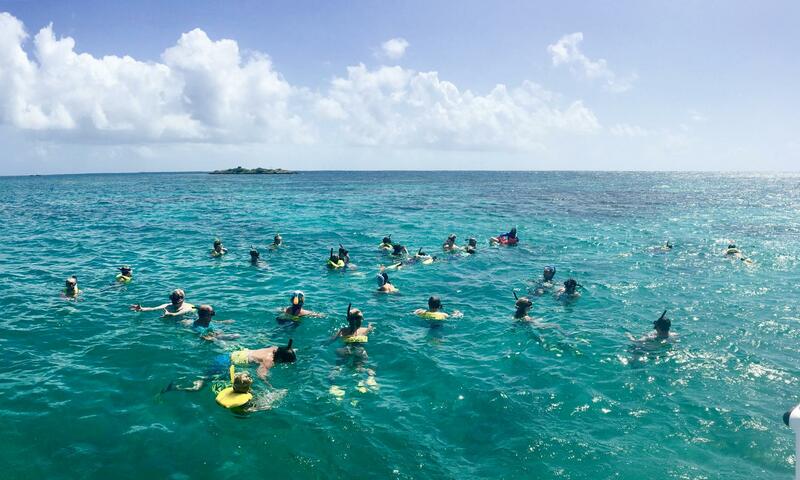 If you want to go on the organised snorkel tour you do pay a little, but it’s very cheap. There are so many places to see and things to do in Antigua you HAVE to leave the resort and explore if you can drag yourself from your sun lounger, head over to the babe that is Sanjay at guest services and she can hook you up with all of the details of the trips available from Shirley Heights trips to visits to Stingray City or go on a boat trip with snorkelling. 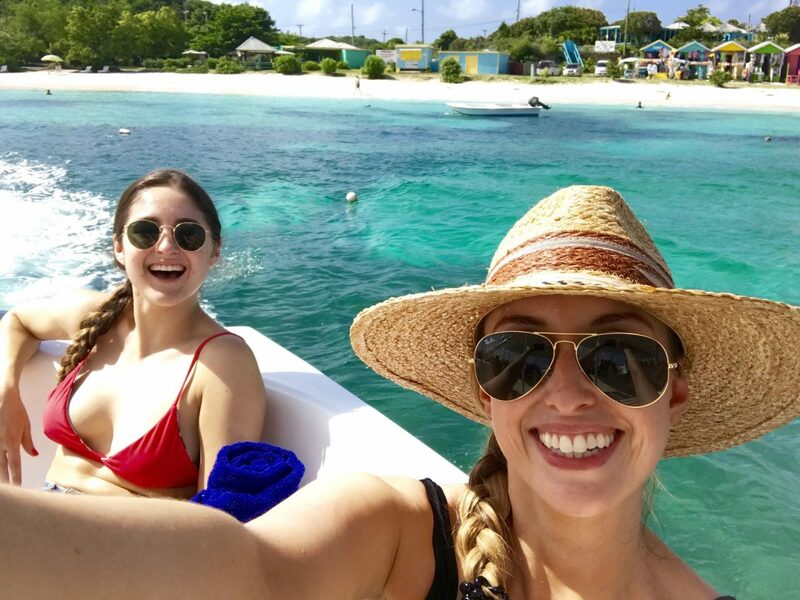 I will be doing a separate post on all the fun things there are to do on the island so stay tuned for that as I will include all the ones available to book with guest services as well as other events that are on throughout the year and tips we got from people along the way. 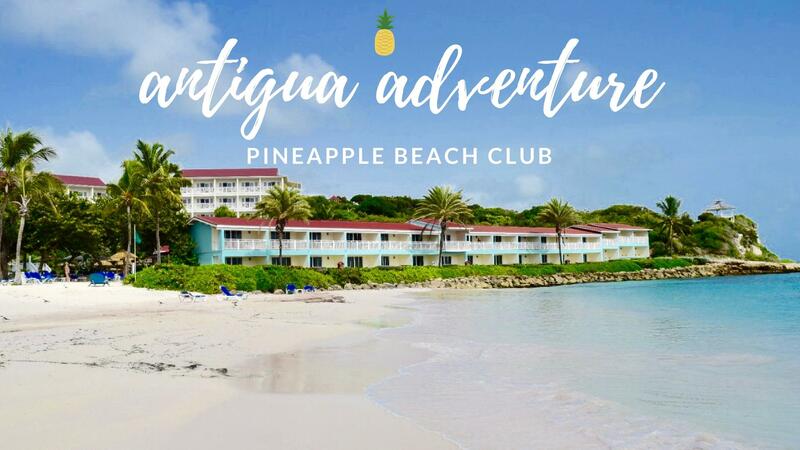 You can either book directly at www.pineapplebeachclub.com and arrange flights separately or 7 nights in Antigua is from £1,095pp with Virgin Holidays including scheduled Virgin Atlantic flights from London Gatwick to Antigua, all-inclusive accommodation at Pineapple Beach Club with transfers included. Price is per person based on two adults travelling and sharing a garden and partial ocean view room, including all applicable taxes and fuel surcharges which are subject to change. Price is based on a departure on September 15 2017. To book: visit www.virginholidays.co.uk, call the Hotline 0344 557 3870 or visit one of our stores in Debenhams, House of Fraser, Tesco, Sainsbury’s or V-Room stores nationwide. No big decisions, no hassle, no stress. 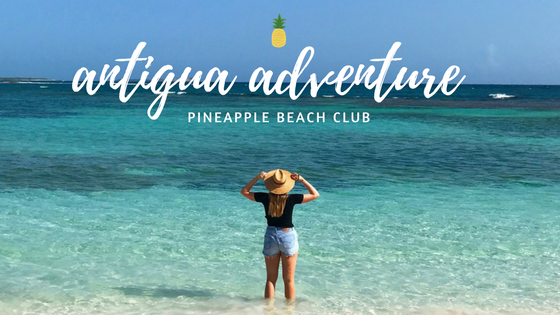 Pineapple Beach was the most relaxing place I’ve been and Antigua was the best holiday I’ve ever had. The only decision you will have to make is to book it. I will 100% be going back in the future and of all the friends I made there who have messaged me since we got back are so sad to be home and desperately planning their next trip! A massive thank you to Sophia for being my travel babe buddy and top photographer. If you do book a holiday here please do go and say hello to Sanjay at guest services and Nika at front desk and give them a hug from me, they are such babes and we miss them already. Just don’t give Nika any Game of Thrones spoilers!